If it’s location-location-location then the Hotel Luna Convento is in the first-division of European coastal accommodation premises. Centred around a cloister founded by St. Francis of Assisi in 1222 (beat that for history), the present day hotel is very much the romantic retreat. The Torre Suite (in an ancient guard tower) was frequented by such Hollywood luminaries as Humphrey Bogart and Ingrid Bergman. But if its sheer age isn’t enough to impress, then its hypothetical guestbook should be: the names of Wagner, Ibsen, Bismark, and Benito Mussolini would be found there. 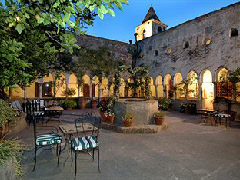 Hotel Luna Convento has a total of 43 guest rooms and suites, an outdoor swimming pool (seasonal), and is four-star classified.